With superb High-Definition visuals and fascinating stories of marine life, this 13-episode natural history series explores amazing undersea subjects including the giant octopus, venomous lionfish, sea lions, and 50-foot whale sharks. 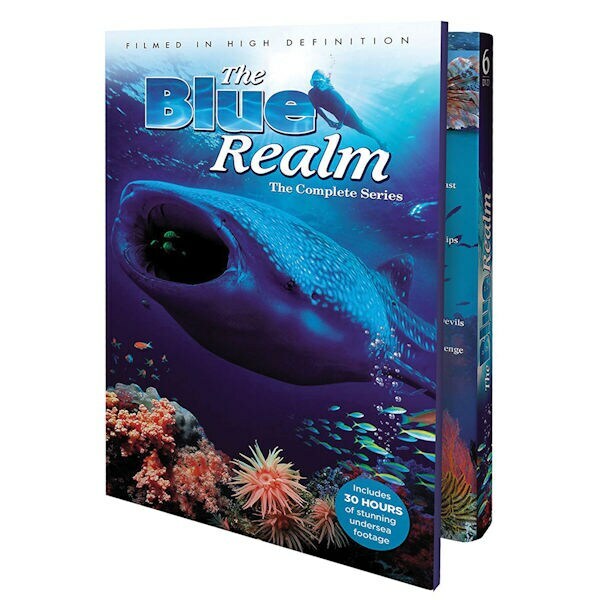 Set also includes the complete 39-episode series Undersea Explorer, featuring even more stunning footage of the mysterious Galapagos Islands, the majestic Great Barrier Reef and more. 42 episodes, 30 hrs, 6 DVDs. • BONUS FEATURE: The Shipsinkers — a one-hour HD special about an intrepid team of adventurers and explosives experts who blow up decommissioned naval vessels and sink them, creating thriving artificial reefs. • 24-page illustrated booklet featuring stunning photography and background information about the Blue Realm episodes.